As a travel photographer you need stay very flexible in the things you photograph. For the most part, I have avoided wildlife photography because of the patience it takes (as well as equipment). But after my trip to Antarctica photographing penguins I fell in love with this type of photography. I love how photos can draw the personality out of animals. From now on, I’m taking every opportunity possible to photograph animals. The simplest rule to remember when shooting animals is to shoot them at eye level. Doing this give more life to the animal and keeps the image from looking flat and the animal from looking small. I shot this on my canon 70-200mm f4L IS. I shot it on F4 at 200mm, with a shutter speed of 1/30. I dropped the exposure by .75 because of strange rainforest lights that cause most shots to overexpose a bit as well. ISO100. Tomorrow there will be a new article posted on my trip to the sustainable city of Curitiba, Brazil. If you’re into the green/sustainability movement it is worth a read. 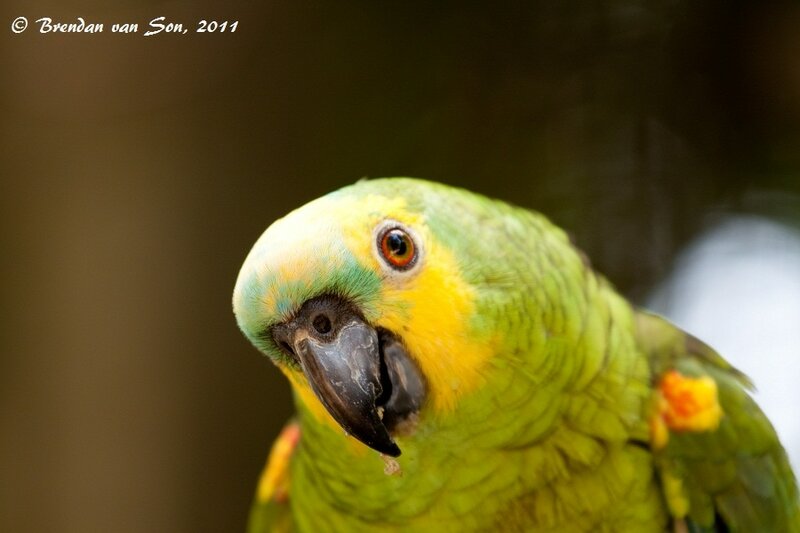 I’m not a huge fan of birds as pets but parrots tend to amuse me from time to time.